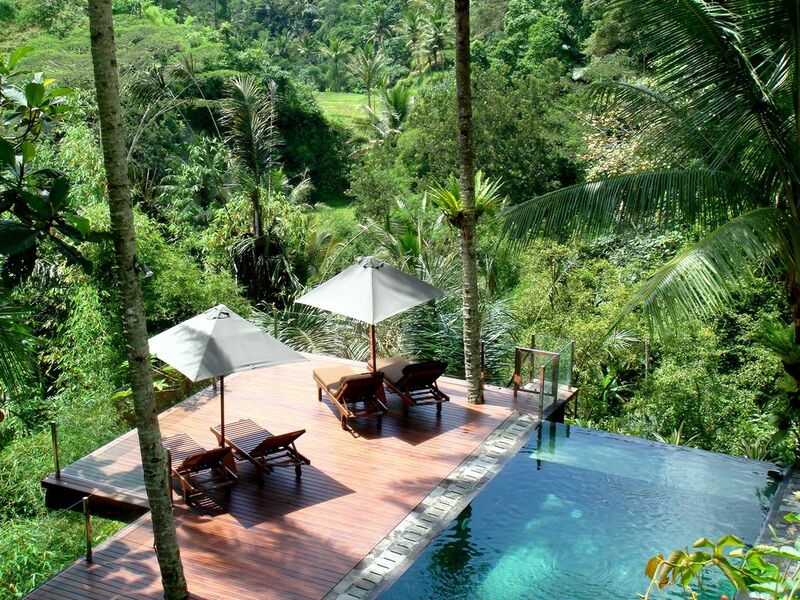 Beautiful Villa for a Romantic Honeymoon or Family Getaway in Ubud, Bali. Are you looking for somewhere you will always remember? A villa that is really special? Villa Kalisha is truly something out of the ordinary. Featured in the Periplus book 'Bali Houses' It is a villa that has it all. When you first walk through the entrance you are instantly hit by the amazing views. The villa almost seems to hang suspended above a steep jungle filled gorge. In all directions there is nothing but trees, but 100m below you there are beautiful rice paddies, and in the distance you can see all the way to the ocean. Furnished by Christopher Noto, the exclusive Singapore furniture designer, Villa Kalisha offers understated romantic luxury, with a strong taste of Asian flare. Night time brings a special ambience when the superb lighting further highlights the villa’s breath-taking location. Exclusively served by four staff who will cater for your every need, Villa Kalisha is perfect for escaping the hectic modern life with loved ones, friends or family. Made our cook will prepare fantastic breakfasts, and a great selection of traditional Balinese and Indonesian dishes, and we can even arrange special meals such as Babi Guling (Balinese Suckling Pig) or Bebek Betutu (Balinese Baked Duck) or BBQ. Nyos our manager, will happily take you for a walk through the surrounding countryside, and major sights like the Tegallalang Rice terraces are a great walk from the villa. Otherwise just kick back and enjoy the peace, tranquility and the cool temperatures (Villa Kalisha is at quite a high altitude, and so is usually about 24 decrees C all year) and let the staff look after you in perfect privacy and serenity. Hi we are Rene and Tom Springall. As itinerant expats, we had nowhere to call home, but we both loved Bali and after several trips here over the years in 2005 we decided to buy our own villa in Ubud and named it after our second daughter (Villa Kalisha). We are still in awe that we own this amazing place. It is my favourite villa (Tom) and I just feel the stresses of the world fall off my shoulders when I walk through the door. Just an amazing place, and our amazing staff (Nyos, Made and Wayan and Wayan) have been with us for the entire time we have owned the villa, which is more than 10 years now. The upstairs bathroom has probably some of the best views in the villa, and as you enter a dramatic open-air vista opens up in all three directions of the jungle and gorge below. Completed in wood and stone of the highest quality, the bathroom also features a remarkable brass bath that provides the perfect place to relax and enjoy the view. The downstairs bathroom, also has great views out across the jungle and gorge, but this time features a fantastic genuine teak bath to relax and enjoy. The lounge bathroom is best for those that are wary of the open air and views of the other bathrooms, and is still a lovely high quality bathroom with its own shower, toilet and sinks just off the upstairs TV lounge, but is more enclosed and private. We have outdoor dining for 8 persons, although more can be accommodated. There is also indoor dining for up to 4 persons around a table, and three more at the kitchen bar area. Villa Kalisha is accessed via a good quality 100m concrete path across the rice fields, and then down into the gorge is about 30 steps, and so is not suitable for wheelchair users or elderly or infirm. Laundry is able to be arranged by the staff at cost (which is very little in Bali). When you book a villa there is always the slight concern that it is not live up to expectations. When we arrived at Villa Kalisha all expectations were exceeded. The villa is spacious the bathrooms are beautiful we stayed in the upstairs bedroom and the view from the bath over the paddy fields is amazing and I like waking up in the tree tops watching the birds and ?chipmunks. we had some concerns about not having air conditioning and even though it was very hot in March it was bearable at night. The staff at the villa are a delight, nothing is too much trouble, everything with a smile. Maddi is a great cook and we also enjoyed a guided walk and spa treatments in the villa. Points to note, there are a number of steps and a walk through the paddy fields to the villa which is enjoyable but does mean that the staff have to carry your case and we all wished we had packed lighter! The deck needs some attention, otherwise absolutely beautiful and I was sad to leave. I just want to write few words about house of my dreams! Villa Kalisha! We visit Bali every year and are lucky enough to have stayed at a lot beautiful places, but to be absolutely honest, Villa Kalisha is the most awe-inspiring, the most stunning, and absolutely the most essential place to stay on the island!! !There is a real spirit of real Bali here... it has a breath-taking view on wild nature. You can sit out on the terraces for hours just listening to the sounds of the jungle. The stylish bathrooms and beautiful bedrooms are wonderful and the pool is a magical place to take a swim. The staff are so helpful and friendly and will cook you up a delicious meal at the same cost as the local Balinese restaurants. If you love nature and the complete feeling of living right in the tree-tops then Villa Kalisha is for you. Nyos [the manager] will take you on walks down through the gorge too…just pure magic!! We will be back. We are really grateful for the review of Villa Kalisha and that your stay was so satisfying - we really hope that you'll be able to return in the near future! We will pass on your comments to the staff as they will be happy to know that they contributed so much to the completeness of your short break with us. We spent 10 amazing days in the villa, it was a fantastic relax holiday in the middle of jungle.The villa has perfect location, you walk through rice fields to the entrance. The staff is also very nice and helpful. I hardly recommend this place for everyone who wants to take a rest in this running world. My husband, his brother and wife and I had a 48 hour trip before arriving to Villa Kalisha. It was late night, we were tired, but when we arrived, all the staff from the Villa gave us a warm lovely welcome. It was fabulous the entrance in the middle of the rice fields. The Villa is hiding in a jungle with beautiful plants and nice view. The furniture, the beds, the bathtubs, the pool, the kitchen, everything is very good looking. Most of the nights we arrived very late, and all the nice people from Villa Kalisha were always available with a smile to receive us. We celebrated our wedding in another place, but when we arrive, there was an AWESOME surprise with rose pedals in our bed and the bath tub with a bottle of champagne. That was something I was not expecting but we Love it. Thank you LOVELY people. We would love to come back and highly recommend this to anyone. Stayed at Villa Kalisha with girlfriends and it was a fantastic break. The entrance walking through the rice fields is very special. The views from the deck are breathtaking and the staff are very warm and accomodating. Can highly recommend a walk through the rice fields with Nyos. The villa is also very tastefully decorated and the bath tubs are great! Villa Kalisha is simply amazing. A walk across the paddy fields takes you to this isolated villa, with stunning views of the surrounding jungle from floor-to-ceiling windows. The pool is beautiful, the bedrooms are huge, and the bathrooms are out of this world. The staff are unobtrusive and friendly and looked after our every need, including providing a delicious meal one evening and an impromtu lunch the next day when we found we just couldn't bring ourselves to leave the villa. I can't recommend this villa enough - it's the most beautiful place I have ever stayed! Bali really needs no introduction. It is one of the premier tourist destinations in the world having an amazing combination of spectacular beaches, striking volcanoes, picturesque rice paddies as well as an incredibly rich and vibrant culture and an open and friendly people. Villa Kalisha is in the ideal position to appreciate all that the Ubud area has to offer. Beautifully situated at the top of a gorge surrounded by rice paddies and jungle, you can walk right out of the door of the villa and be in some of the most beautiful traditional villages in Bali, and yet the cosmopolitan restaurants, bars, and shops of Ubud are only 20 minutes away. Minimum stay is 1 night for enquiries for stays within one month, or for stays adjacent to an existing booking. Otherwise Minimum Stay is 2 nights in Low and Mid Season; 3 nights in High Season; 5 nights in Peak Season. Rate is inclusive of taxes, and includes unlimited tea, coffee and water, and the exclusive use of the villa facilities and the services of the dedicated staff including cook, housekeeper, gardener and general manager who also can help you in arranging trips, tours, massages or anything else that you need. Linens, towels and toiletries are also included We can also provide a full breakfast with fresh juice and fresh fruits, wholemeal and white toast, and jams and spreads ((including home favorites such as Marmite and Nutella), a selection of cereals, and a choice of eggs and bacon or pancakes or Asian breakfast (fried rice / fried noodles). There is however an additional charge to cover the cost of groceries, which is discounted to IDR 60,000 / guest or IDR 35,000/child under 10) if paid for in advance upon arrival (otherwise the standard 20% villa charge will apply). Infants (2 and under) are free for breakfast. Alternatively you can pay as part of your accommodation, in which case the price is £3.50/guest (£2.00/child under 10) and we can add it to your bill. All other meals and drinks are available at the cost of groceries, plus a 20% villa charge that goes to cover the costs of providing food and drink for guests. We make no money from providing food - we only aim to cover our costs, which include transport to fetch provisions, and other costs.